Tumbling battery prices mean that EVs will not just have lower lifetime costs, but will also be cheaper to buy than internal combustion engine cars in most countries by 2025-29. London and New York, 6 July 2017 – Electric vehicles will make up the majority of new car sales worldwide by 2040, and account for 33% of all the light-duty vehicles on the road, according to new research published today. The forecast, put together by the advanced transport team at Bloomberg New Energy Finance, draws on detailed analysis of likely future reductions in price for lithium-ion batteries and of prospects for the other cost components in EVs and internal combustion engine, or ICE, vehicles. It also factors in the rising EV commitments from automakers and the number of new EV models they plan to launch. The central finding of the research is that the EV revolution is going to hit the car market even harder and faster than BNEF predicted a year ago. 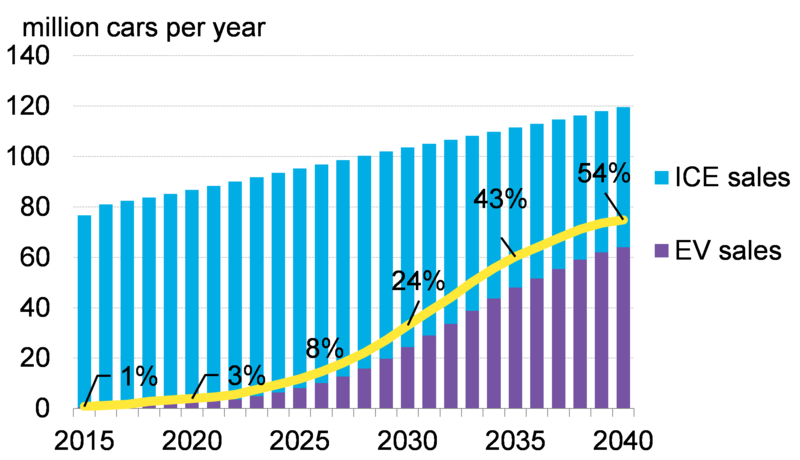 The team now estimates that EVs will account for 54% of all new light-duty vehicle sales globally by 2040, not the 35% share it forecast previously. By 2040, EVs will be displacing 8 million barrels of transport fuel per day and adding 5% to global electricity consumption. The forecast shows EV sales worldwide growing steadily in the next few years, from the record 700,000 seen in 2016 to 3 million by 2021. At that point, they will account for nearly 5% of light-duty vehicle sales in Europe, up from a little over 1% now, and for around 4% in both the U.S. and China. The key component of an EV – the battery – is set to plunge in price, building on recent, remarkable cost declines. Since 2010, lithium-ion battery prices have fallen 73% per kWh. Manufacturing improvements and more than a doubling in battery energy density are set to cause a further fall of more than 70% by 2030. The result will be rapidly rising market shares for electric vehicles in the biggest markets, even with oil prices staying low. 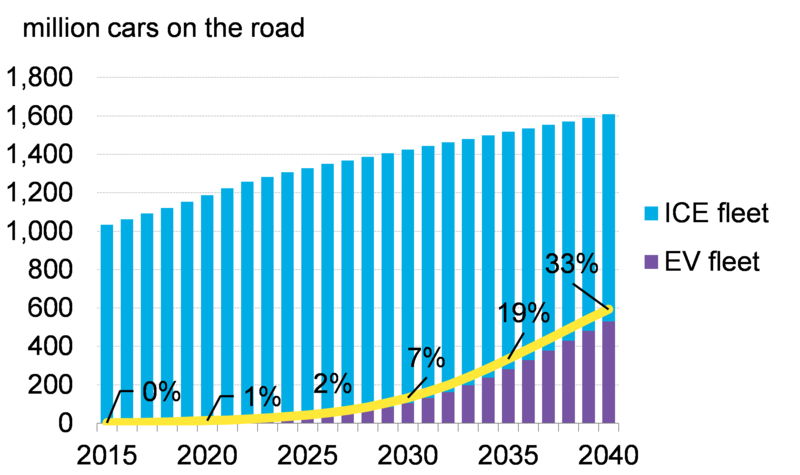 BNEF sees them accounting for nearly 67% of new car sales in Europe by 2040, and for 58% in of sales in the U.S. and 51% in China by the same date. Countries that have made early progress in EV uptake are expected to be among the leaders in 2040, including Norway, France, and the U.K. Emerging economies such as India are forecast not to see significant EV sales until the late 2020s. The team incorporated work into their EV forecast work on two other hot topics in the transport revolution – autonomous vehicles, and ride sharing. It concluded that the impact of autonomous driving will be limited in the next 10 years but will play an increasing role in the market after 2030, with 80% of all autonomous vehicles in shared applications being electric by 2040 due to lower operating costs. An executive summary of BNEF’s 2017 electric vehicle forecast can be downloaded by the media from the micro-site on this link. Bloomberg New Energy Finance is powered by Bloomberg’s global network of 19,000 employees in 192 locations, reporting 5,000 news stories a day. Visit about.bnef.com/ or request more information.